Wal-Mart is the king of retail, but did you know that Clorox and J.M. Smucker have bargaining power with it? Wal-Mart Stores (NYSE:WMT) released its third-quarter financial results earlier this month, announcing $1.14 in earnings per share -- a 6.5% increase from last year's third-quarter earnings. While many retailers struggle amid high unemployment and weak gross-domestic-product growth, Wal-Mart continues to grow richer each year. Wal-Mart receives harsh criticism for paying its rank-and-file employees less than it takes to breach the federal poverty level. Although Wal-Mart's wages are competitive with other retailers, its insane profitability may explain why Wal-Mart is the face of corporate evil and not, say, Sears. Wal-Mart reported nearly $17 billion in net income for fiscal 2013. That comes out to $32,342 per minute -- more than most of its employees earn in an entire year. Wal-Mart's executive pay is not helping to squelch animosity toward the company's pay practices either. According to data compiled by Nerd Wallet, outgoing CEO Mike Duke's pension is worth $113 million -- 6,182 times higher than the average 401(k) balance for Wal-Mart employees. Given that Wal-Mart has a durable competitive advantage as the largest retailer on earth, it is unlikely that any executive creates $100 million in additional value for the company. To paraphrase Warren Buffett, Wal-Mart is a business that even an idiot can manage successfully. Despite excessive executive pay, Wal-Mart's market leadership and enormous profits provide reasons to buy and hold the stock. (2) The Walton Family is collectively worth more than the poorest 30% of Americans combinedThe heirs to Sam Walton's fortune collectively own more than half of Wal-Mart's stock -- a stake worth more than $130 billion. Combined, the Waltons are worth more than the poorest 30% of Americans. Although somewhat misleading (about 25% of Americans have zero or negative net worth, therefore anyone with a buck to their name is richer than the bottom quartile), the Walton family's massive wealth is evidence of the enormous value created by Wal-Mart in its 51 years of operation. 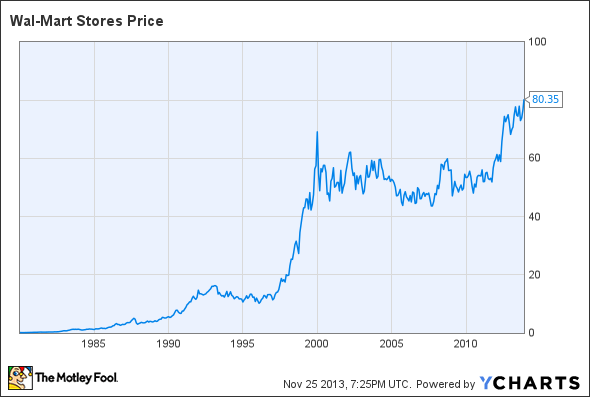 Indeed $10,000 invested in Wal-Mart in 1973 would be worth $12.7 million in 2013. It may be hard to believe, but even big and established companies like Clorox (NYSE:CLX) and J.M. Smucker (NYSE:SJM) would be severely hampered if Wal-Mart stopped carrying their products. The two companies -- with a combined market value of $23 billion -- depend on Wal-Mart for 26% of their sales. Unlike many of Wal-Mart's smaller suppliers, Clorox and J.M. Smucker are not completely at the mercy of the retail giant. Many of Clorox's brands are must-haves for any retailer -- including Wal-Mart. According to Morningstar, 90% of Clorox's portfolio is the No. 1 or No. 2 brand in its category. If Wal-Mart did not carry its brands, which include Glad, Hidden Valley, and Kingsford, consumers might opt to go to a retailer that did carry those brands. Likewise, Smucker's lineup of must-have brands includes Folgers, Jif, and Pillsbury. Therefore, Wal-Mart's relationship with these megabrands is symbiotic in nature, not exploitative. A study conducted by Charles Courtemanche, assistant professor of economics at The University of North Carolina at Greensboro, found that "the proliferation of Wal-Mart Supercenters explains 10.5% of the rise in obesity since the late 1980s." The author surmises that Wal-Mart's low prices enable people to buy more food, thus allowing them to stuff their faces more than they used to. A more cynical observer might conclude that Wal-Mart's low wages have forced its poor employees to eat fast food because it is all that they can afford. Wal-Mart is an all-American success story. Like all success stories, it has its share of controversy. But no matter what comes up, the world's largest retailer will continue generating billions in profits for shareholders as each year goes by.